@#3 on my list of Bob Dylan’s top 200 songs. We allow our past to exist. Our credibility is based on our past. But deep in our soul we have no past. I don’t think we have a past anymore than we have a name. You can say we have a past if we have a future. Do we have a future? No. So how can our past exist if the future doesn’t exist? But we’re only dealing with the past in terms of being able to be healed by it. We can communicate only because we both agree that this is a glass and this is a bowl and that’s a candle and there’s a window here and there are lights out in the city. Now I might not agree with that. Turn this glass around and it’s something else. Now I’m hiding it in a napkin. Watch it now. Now you don’t even know it’s there. It’s the past… I don’t even deal with it. I don’t think seriously about the past, the present or the future. I’ve spent enough time thinking about these things and have gotten nowhere. It appeared on his album Blood on the Tracks in 1975. Released as a single, it reached #31 on the Billboard Hot 100. Rolling Stone ranked it #68 on their list of the 500 Greatest Songs of All Time. 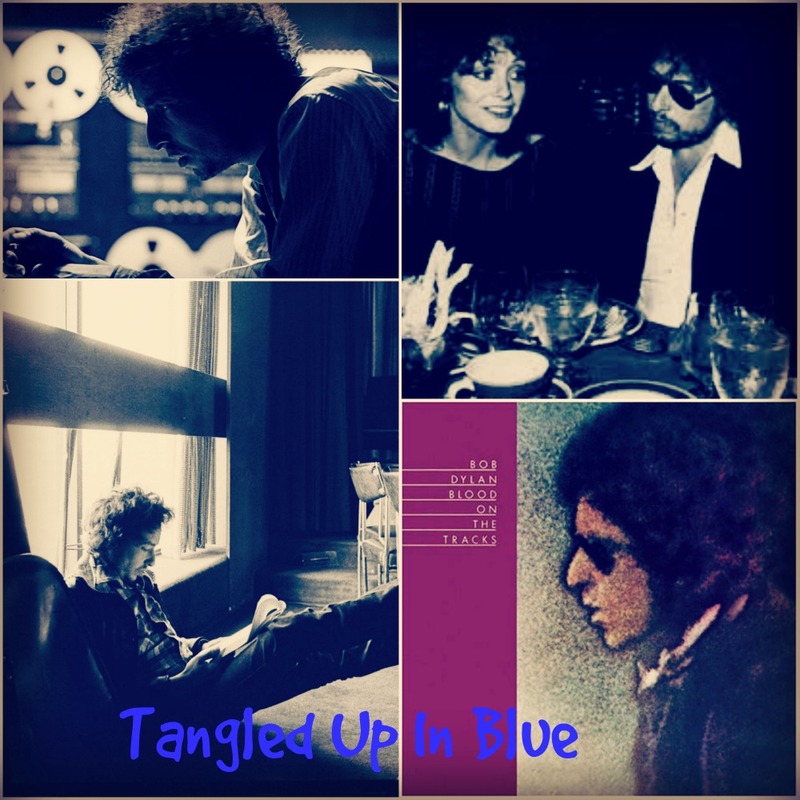 “Tangled Up in Blue” is one of five songs on Blood on the Tracks that Dylan initially recorded in New York City in September 1974 and then re-recorded in Minneapolis in December that year; the later recording became the album track and single. One of the September 1974 outtakes was released in 1991 on The Bootleg Series Volumes 1–3 (Rare & Unreleased) 1961–1991. The New York version of this song is in open E tuning. According to novelist Ron Rosenbaum, Bob Dylan once told him that he’d written “Tangled up in Blue”, after spending a weekend immersed in Joni Mitchell’s 1971 album Blue. 1st Blood On The Tracks recording session, produced by Bob Dylan. 1 take – released on THE BOOTLEG SERIES (RARE & UNRELEASED) 1961-1991, VOLUME 2, March 26, 1991. 2nd Blood On The Tracks recording session, produced by Bob Dylan. Take 2 or 3 released on the test pressing of BLOOD ON THE TRACKS, COLUMBIA PC-33235, November, 1974. 6th and last Blood On The Tracks recording session, produced by Bob Dylan. No record of how many takes were done. Released on BLOOD ON THE TRACKS, January 20, 1975. Although the second album printing reveals a mottle-hued Dylan contemplating a blood-red backdrop, the predominant color is blue. The blues can be sprightly, and the album takes off with a sense of motion. There is a wistful searching, the quest myth again, but perhaps he always looks for the same thing in a lot of people, and always ends up contemplating the mirror of his self. Dylan puns, as the “day the axe just fell”20 in the woods; a phrase out of common parlance, “keep on keepin’ on,”21 is returned, renewed, to the language. The Dante allusion remains ambiguous. In the New York tape and the folio, the poet dates from the thirteenth century, while the record makes it the fifteenth. (Dante’s work spanned the thirteenth and fourteenth centuries.) Wallace Fowlie reportedly thinks Dylan echoes a poet friend of Dante, Guido Cavalcanti. A new sort of road song, in which a dried-out spirit, not dusty boots, recalls his long march. Did he take the right turns? Dylan prefers the Real Live version. “Tangled Up in Blue” is so beguiling in its language and story-technique, and so richly and lovingly sung, we may find ourselves overlooking another aspect of its power: its extraordinary rhythmic core. This song pulses. Its six minutes pass in a flash and you want to hear it again. As an album-opener, it propels us forward into the rest of the music. It is a love song, and a song about how it feels to have a personal history (the story of the story of our lives), but it is also a great road song, filled with the essential energy of the American highway. The Minnesota musicians Dylan performs with here achieve an unforgettable groove, bass and drums and acoustic guitars (one a twelve-string, it sounds almost like a harpsichord at times) totally blended into a new and different wild mercury sound. Beyond that wonderful use of a formal, limiting shape and structure to yield scintillating leaps of feeling and expression, ‘Tangled Up in Blue’ contains a whole assortment of verbal spikes and explosions that all operate not as distractions from the main body of feeling in the song but as ways of evoking the emotional complexity and urgency of it all. That Dylan can make time, in the course of what is delivered as a fast, breathless narrative, for flashes like this—‘I had a job in the Great North Woods…/But I never did like it all that much/ And one day the axe just fell’—shows an alertness and mental dexterity that augments the emotional seriousness and depth of the song. And there is an accompanying dexterity of sketching in, quick as a flash, a whole range of universally recognisable moments in fresh, intensely accurate strokes of language, from the evoked dialogue with inbuilt self-mockery here—‘She lit a burner on the stove / And offered me a pipe / ‘‘I thought you’d never say hello,’’ she said / ‘‘You look like the silent type’’’—to the very funny sureness of touch in this summary of that common feeling of what- ever-happened-to-those people: ‘Some are mathematicians / Some are carpenters’ wives / Dunno how it all got started / I dunno what they’re doin’ with their lives’, where that last line communicates the inevitable ambiguity of feeling—sadness at time’s destruction of friendships and at the same time, truly, an indifference to where or what those people are now. “Tangled Up in Blue” characterizes the return of the great Bob Dylan, the author of the trilogy Bringing It All Back Home, Highway 61 Revisited, and Blonde on Blonde, all written under the influence of the French poet Arthur Rimbaud. The song shares the desire for journeys to far-off places (see the reference to slave traders in the sixth verse). This banal tale of a love that has ended takes on an epic dimension. Dylan continuously reworked the lyrics during the recordings, mostly telling the story in the third person singular, probably to signify that the narrator was a witness, not an actor. In the official version, however, he sings in the first person singular, as if he wants to indicate a personal involvement. The most dazzling lyric ever written, an abstract narrative of relationships told in an amorphous blend of first and third person, rolling past, present and future together, spilling out in tripping cadences and audacious internal rhymes, ripe with sharply turned images and observations and filled with a painfully desperate longing. The received wisdom is that the Blood On The Tracks songs were wrung from an anguished Dylan during the collapse of his marriage to Sara Lowndes, which is probably an over-simplification. In any event, “Tangled Up In Blue” – the album’s opening track – found Dylan essaying a mythic reinterpretation of his whole life, a metaphorical death and transfiguration. As the narrative sweeps from his Minnesota upbringing, through the coffee house days in New York, down to New Orleans and then out west, the singer’s quest is haunted by fateful visions of a female soulmate, and littered with biblical allusions (he temporarily works as a fisherman, and friends become “carpenters’ wives”). It was a dazzling curtain raiser for an album riddled with symbols, signs and coincidences. It might be possible (and somebody may have done it already) to write a doctoral thesis on Bob Dylan’s use of pronouns. If such a study were attempted, a great deal of space could be taken up with a discussion of “Tangled Up in Blue,” a song Dylan wrote in 1974 that became the leadoff track of one of his greatest albums, Blood on the Tracks. 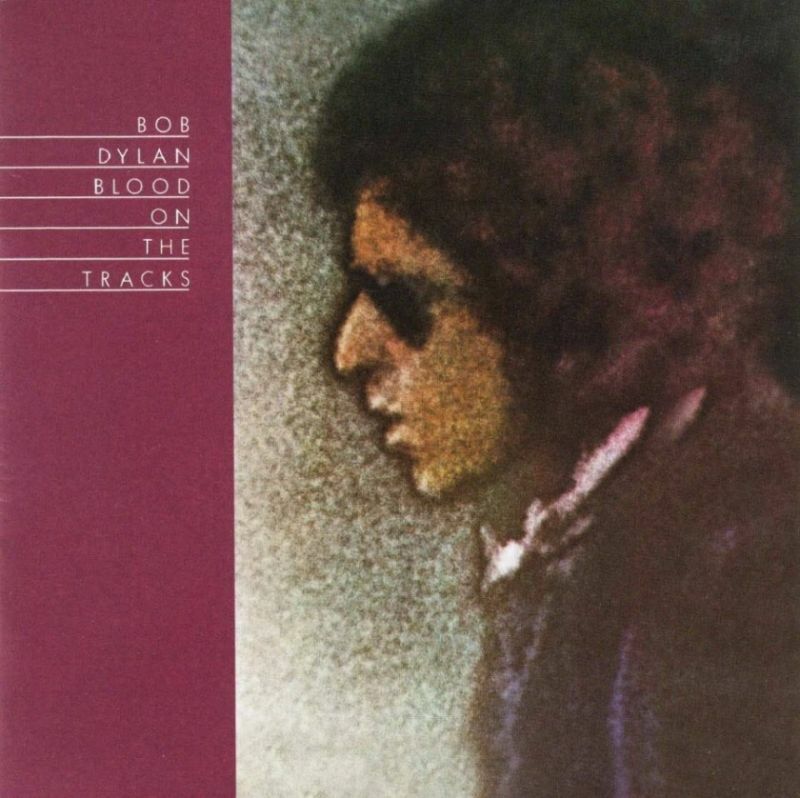 The grand subject of Blood on the Tracks was the ups and downs of mature romantic relationships, and “Tangled Up in Blue” served as a masterful introduction, a seven-verse narrative about a couple or about a romantic triangle, or perhaps about several different couples. The ambiguity is increased by the different versions of the song that exist. “[This song] took me 10 years to live, and two years to write,” Dylan often said before playing “Tangled Up in Blue” in concert. His marriage was crumbling in 1974 as he wrote what would become the opener on Blood on the Tracks and his most personal examination of hurt and nostalgia. Dylan’s lyrical shifts in perspective, between confession and critique, and his acute references to the Sixties experience evoked a decade of utopian dreams and broken promise. His plaintive vocal and the fresh-air picking of the Minneapolis session players hearkened to an earlier pathos: the frank heartbreak and spiritual restoration in Appalachian balladry. Dylan has played this song many different ways live but rarely strays from the perfect crossroads of this recording, where emotional truths meet the everlasting comfort of the American folk song. I always wanted it to be the way I recorded it on Real Live, but there was no particular reason for it to be that way, because I’d already made the record. .. I rewrote it in a hotel room somewhere. I think it was Amsterdam. I wanted to sing that song so I looked at it again, and I changed it. When I sang it the next night I knew it was right. It was right enough so that I wanted to put it down and wipe the old one out. That was another of those songs where you’re writing and you’ve got it, you know what it’s about, but half of it you just don’t get the way you wanted to. Then I fixed it up, and now I know it’s where it should be. I think it makes a big difference, too. 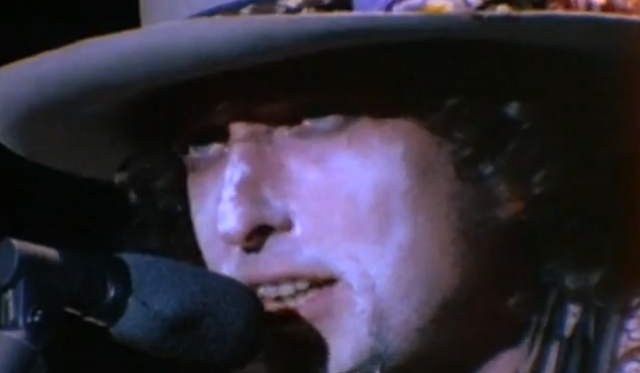 Dylan re-wrote the ‘She opened up a book of poems’ verse towards the end of his 1978 world tour, changing it to ‘She opened up the Bible and started quotin’ it to me’, so that it became, thereby, one of his first public suggestions of having converted to Christ; then he re-wrote the song wholesale for the 1984 tour of Europe, not merely rewriting lines of lyric but restructuring the whole song (a braggadocio version of the re-write is on the album Real Live); but ever afterwards Dylan reverted to the earlier structure and the original lyric (with minor variations), and devoted himself to making it one of his most over-performed repertoire items.